Free Press-- An organization that's helping to unify and give direction to the growing media democracy movement in this country. Their site is a clearinghouse of information on the FCC ownership rules fight, low power radio, the struggle for democratically accountable public broadcasting and other areas of media policy. Links to 100s of other groups. Chicago Media Action-- Chicago's leading (and most radical) media reform group. They've helped to organize resistance against the FCC's ownership rules changes, screened dissident documentaries and pressured public TV station WTTW to be more accountable to the public. If you're in the Chicago area and are interested in media reform, you need to hook up with them. Media Democracy Chicago-- Another local media reform group, focused more on media issues related to electoral politics. Active on license renewal challenges as well as other issues. Americans for Radio Diversity-- People pissed off about the state of the commercial radio. Future of Music Coalition-- Fighting for the rights of musicians against the big record labels and radio chains. Prometheus Radio Project-- An advocacy group that works to strengthen community radio. Reclaim the Media-- Seattle-based media reform group. Take Back Our Media -- A visually stunning site loaded with ideas about how to curb the growing power of media conglomerates. Media Tank-- Solid information on media policy issues. Action Coalition for Media Education-- A media literacy organization that aims to "prevent media education from becoming watered down by profit-driven or appreciationist agendas." Union for Democratic Communications-- Radical communications scholars with an activist bent. The Association for Progressive Communications-- Using IT and communications technology (like the internet) in the cause of Third World liberation and sustainable development. Media Justice-- Working to establish and expand independent media produced by and for oppressed and marginalized communities. Downhill Battle-- Organizing against the RIAA's lawsuits targeting people who "file swap" copyrighted music. Makes the case that downloading tunes hurts the corporate record companies more than it does individual artists. The Center for Digital Democracy--Campaigns to preserve the diversity and openness of the internet. Great source of information about digital policy issues. Electronic Frontier Foundation-- Another group working to protect on-line freedom. The Free Expression Network-- A network of organizations dedicated to defending and expanding our First Amendment rights. The Free Expression Policy Project-- A project of the Brennan Center for Justice. Providing research and advocacy on free speech, copyright and media democracy issues. White Dot--Group based in Chicago and the UK that urges people to turn off the TV and "Get a Life!" Women in Media & News-- A media analysis, training and advocacy organization for women's voice and representation in media. Commercial Alert-- Working to keep our children's education free of Channel One and other forms of blatant commercialism. 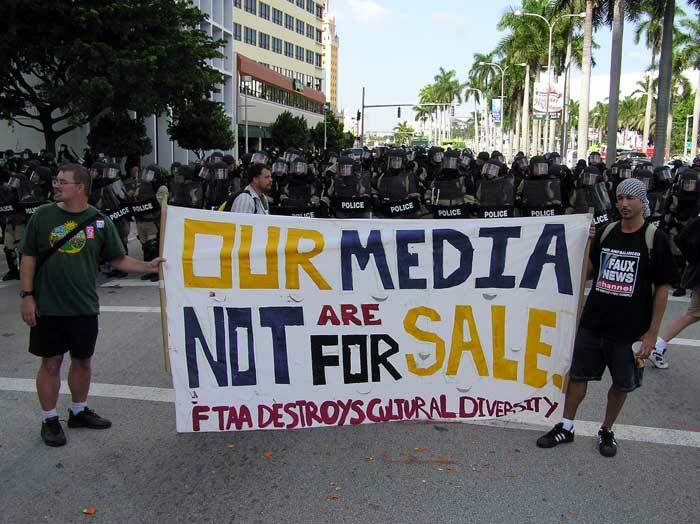 With the group Free Press at the FTAA ministerial in Miami, protesting the trade pact's damaging potential impact on media diversity and cultural democracy in the Americas . That's me on the left holding the banner.